Compass Pointe is a luxurious community in Leland, North Carolina located minutes from Wilmington. It offers thoughtful amenities and plenty of activities to stay socially active and physically fit throughout the year. Numerous homebuilders are developing homes within Compass Pointe. Homebuyers can find a residence that meets their unique tastes and needs. All homes include first-floor master suites and a variety of customizable floor plans. There are many amenities for residents to enjoy while living within Compass Pointe. 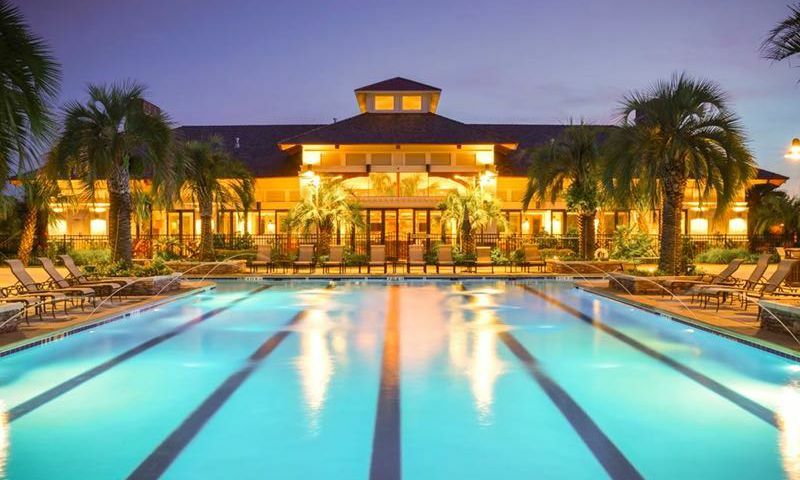 The Grand Lanai Amenities Center is a 10,000 square-foot clubhouse that is the central hub of the community. Here residents use the multi-purpose rooms, catering kitchen, lounge, and TV area to meet with neighbors for fun activities and social events. Outdoors, a resort-style pool and patio are great places to soak up the sun. Two lighted tennis courts allow residents to compete at almost any time of the day. The Pointe Wellness Center & Spa is a separate facility that offers multiple wellness-related amenities. This 7,000 square-foot facility offers a state-of-the-art fitness center equipped with spin bikes, cardiovascular and strength-training machines. Group fitness rooms are on hand for exercise classes too. Residents can pamper themselves with spa services or relax their muscles in the sauna and steam rooms. Compass Pointe is a scenic community where residents can enjoy the area's mild climate with plenty of outdoor amenities. Homeowners enjoy access to a dog park, lake beach, walking and biking trails, as well as miles of parks and natural space. Golf enthusiasts will be pleased to know that an 18-hole championship golf course is underway. Currently, this Rick Robbins-designed course is under construction. Once completed, it will include a pro shop and practice facilities. Development of Compass Pointe started in 2007 and offers new and resale homes. This sprawling community will eventually encompass 2,000 homes situated in different neighborhoods. Buyers can find an attached or single-family home offered by numerous builders. Homes range in size from about 1,600 to just over 3,000 square feet in many different floor plans. Typically most homes have two to four bedrooms, two to four bathrooms, and an attached two-car garage. Many homes include customizable options and focus on low-maintenance living in a resort setting. Throughout the year, Compass Pointe residents take part in a variety of planned activities from day trips to cards and games. Many homeowners participate in outdoor activities like tennis, pickleball, walking, fishing, golfing, and water fitness. It's always easy to get to know new neighbors with clubs that celebrate birthdays, help plan parties, host events, and more. Compass Pointe is ideally located in Leland just minutes from Wilmington, where southern charm meets culture and history. The Wilmington Riverwalk offers a variety of shops and dining options along the scenic Cape Fear River. Whether looking to attend plays at the Thalian Hall or viewing shows at the Cameron Art Museum or shopping at the farmers' market, there's something for everyone in Wilmington. When traveling farther than Wilmington is on your agenda, Wilmington International Airport is easily accessible from Compass Pointe. Closer to home, Leland is a welcoming small town with parks, recreation, and arts. During the summer, an annual Concerts on the Coasts series hosts live music for residents. Movies in the park is also a popular tradition for residents and their friends and family. With so much to do around the area and within the community, it's no wonder that Compass Pointe is a popular resort community with homebuyers in Coastal North Carolina. Grand Lanai Amenities Center - 10,000 Sq. Ft. The Pointe Wellness Center & Spa provides everything you need for fitness and overall wellness. The Pointe Wellness Center - 7,000 Sq. Ft.
An 18-hole championship golf course designed by Rick Robbins. There are plenty of activities available in Compass Pointe. Here is a sample of some of the clubs, activities and classes offered here. Bill Clark Homes is one of many great homebuilders developing in Compass Pointe. They offer homes that range in size from 1,641 to 2,873 square feet. These homes include three to four bedrooms, two to four bathrooms, and an attached two or three-car garage. Low-maintenance exteriors are great features of these homes. Firetti Builders Inc. offers five models that range in size from 1,685 to 2,462 square feet. Homebuyers can find a floor plan that has one to three bedrooms, two to three bathrooms, and an attached two-car garage. Horizon Homes offers ten floor plans that range from 1,668 to 2,685 square feet in size. These homes have two to four bedrooms, two to three bathrooms, and an attached two-car garage. Homebuyers can find 14 models by Hagood Homes in Compass Pointe. They range in size from 1,799 to 3,492 square feet. These residences often include two to four bedrooms and bathrooms with an attached two-car garage. Liberty Homes offers numerous models that have two to four bedrooms and two to four bathrooms. These homes include an attached two-car garage and have between 1,700 and 3,432 square feet of living space. Southern Homebuilders offers two models: the Creekside and Savannah. They include 1,738 to 2,060 square feet of living space with three bedrooms, two or three bathrooms, and an attached garage. Homes by Geoff Weatherwax Construction have two to three bedrooms, two or three bathrooms, and an attached two-car garage. These three models range in size from 1,836 2,246 square feet. Logan Homes offer optional private swimming pools. These residences include three bedrooms, two or three bathrooms, and an attached two-car garage. Two models from Heritage Builders include two to three bedrooms, two-and-a-half to four bathrooms, and an attached two-car garage. 55places.com is not affiliated with the developer(s) or homeowners association of Compass Pointe. The information you submit is distributed to a 55places.com Partner Agent, who is a licensed real estate agent. The information regarding Compass Pointe has not been verified or approved by the developer or homeowners association. Please verify all information prior to purchasing. 55places.com is not responsible for any errors regarding the information displayed on this website.